All the processes of making the wines, from the harvested grapes to the bottle, are carried out by us here at the Domaine. Although we work on a relatively small scale (we make around 16,000 bottles per year altogether), we are well equipped with the essential gear to produce top quality. This includes a modern, fully programmable pneumatic press (especially important for the whites and rosé), electronic temperature controllers, an automatic cooling circuit and the use of inert gas to protect the wines from air contact when necessary. 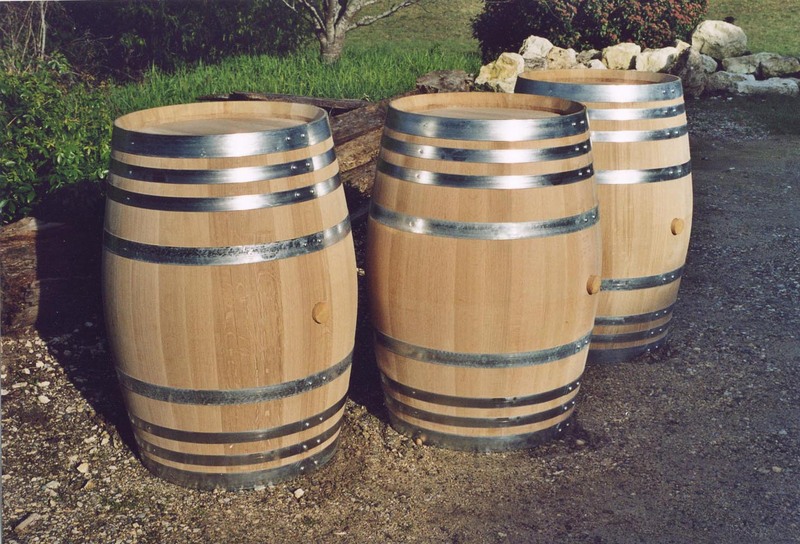 For our barrel aged reds, we use high quality barriques of 225 litres made from French oak by some of the best tonneliers (coopers). We use wood from different parts of France and different tonneliers to add more complexity to the wine. 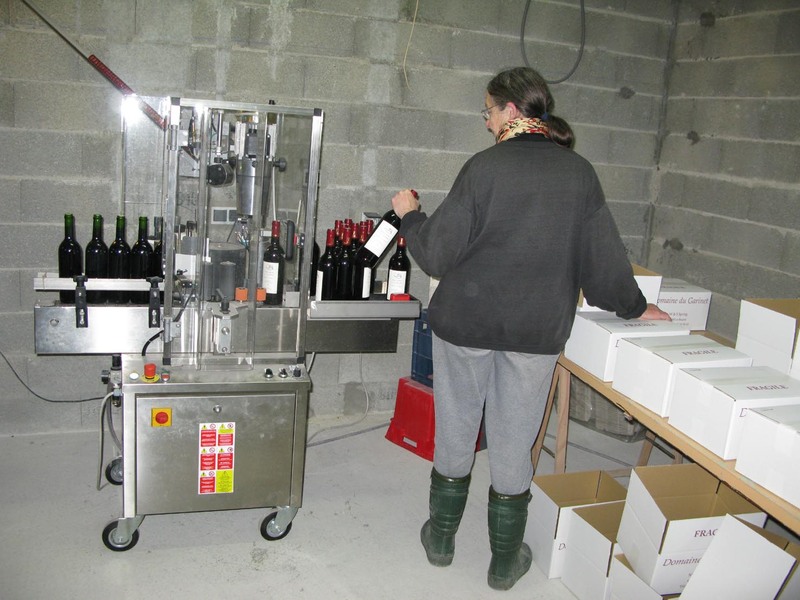 Bottling is done using a specialist contractor who brings his bottling and corking machine to the Domaine to work with us. This means we benefit from a more modern and better machine than we could justify owning ourselves, plus the considerable expertise of the machine operator. Bottles are stored in a fully underground, purpose built cellar that retains a nearly constant temperature through the year. Good storage conditions are important for us because we aim to sell our (red) wines only after an extended period of bottle aging. On the contentious question of bottle closures, our policy is to use natural corks for the wines which are to age in bottle, and modern conglomerate corks for the white, rosé and young-drinking red wines. More details below under Bottling. More - The sections below provide more detail of how we make our wine, and winemaking in general. 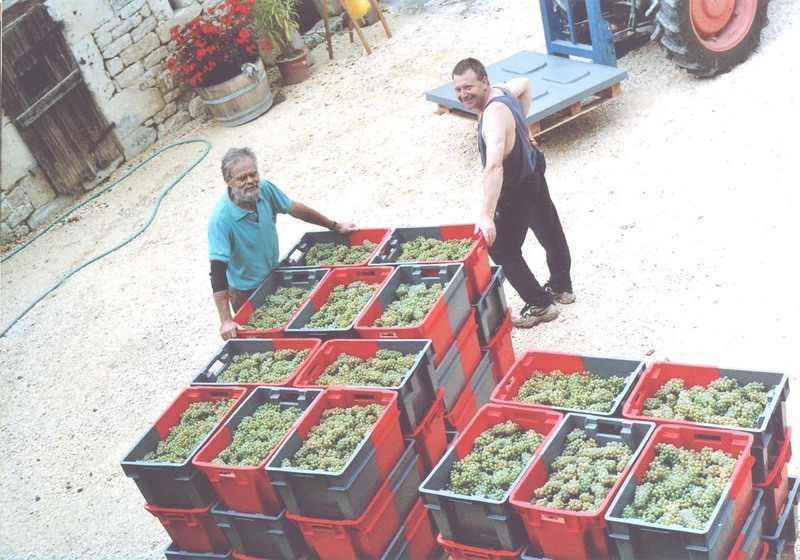 This account describes how we make our wine at Domaine du Garinet, but is broadly mainstream. Larger properties will have some very expensive pieces of machinery, which our small volumes cannot justify. The purpose of many of these is to save labour and/or reduce wastage; for quality, we have all the equipment required. White wine is made by crushing and then pressing the grapes immediately after harvest. The juice is fermented alone, usually slowly at low temperature (12-18°). The solid matter from the grapes is left in the press and is not used further. For red wine, the grapes are crushed and the resulting mixture of juice and crushed solids is pumped directly into a vat for fermenting. This is because the red colour is initially contained in the skins – the fresh juice of (nearly) all grapes both red and white is nearly colourless. Thus to make red wines, the skins and juice must remain together to allow the colour (and a lot of flavouring elements) to be extracted into the juice. The time of contact varies depending on the type of red wine being made. The juice and skins are fermented together more quickly and at a higher temperature (24-28°) than white or rosé. During this period the solid material floats to the top of the vat and forms a cap over the juice. Various methods are used to mix up the solid and liquid components, to achieve the required amount of extraction from the solids to the juice. When sufficient extraction has taken place, the juice is run off from under the cap, and the solids are then removed from the vat and pressed to extract the remaining juice (the press wine) which they contain. This may be done before fermentation is complete, or up to a week or two after, depending on the style of wine to be made. Rosé wine can be made in several ways – in our case we make two batches by different methods that are eventually blended together to get the benefits of both types. The first method is called saignée (bleeding) and works by removing a proportion (up to 10%) of the juice from a red vat about 12-24 hours after the harvest, when the juice has picked up the desired amount of colour from the skins. This juice is then fermented slowly at low temperature, as for white wines. The second method is by pressing. The grapes are put into the press where they may be left for a time (around 4-12hrs) to pick up colour and fruit. They are then pressed and the juice fermented, just as for white wine. A recent proposal to relax European regulations to allow rosé to be made by blending red and white wine, hitherto forbidden, has been abandoned at the last minute (June 2009). 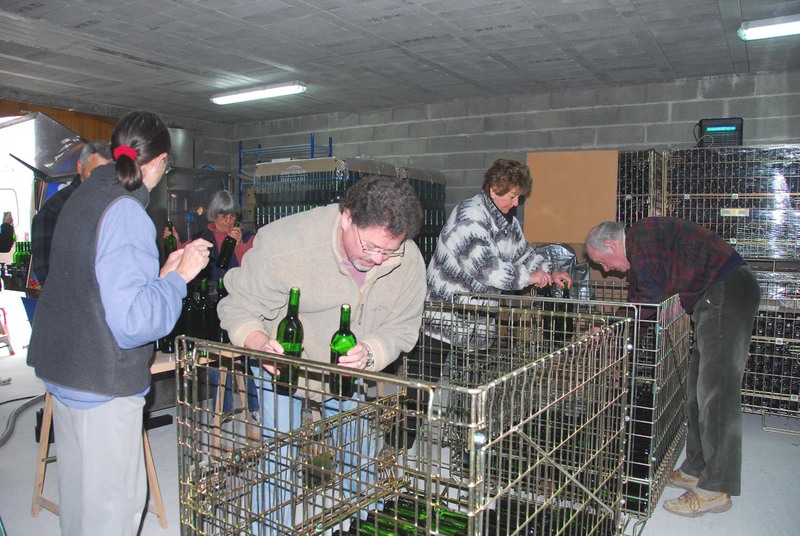 This method is allowed in some other wine-producing countries, but is generally regarded as suitable only for mass-produced wines of ordinary quality. Such wine is likely to lack the delicate fruit of a good rosé, and may contain tannin from the red wine, giving a bitter finish. It’s perhaps helpful to distinguish between crushing and pressing. Crushing is the process done in olden times by feet. Its purpose is to break the grapes gently so that the juice can run. Pressing is a more brutal process – it consists of applying great pressure to the grapes, crushed or not, to extract and separate the juice from the solid material. 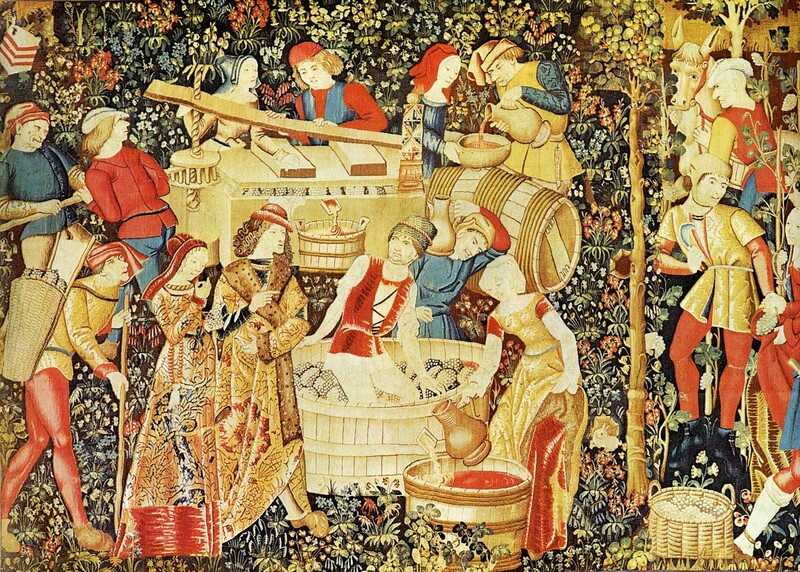 If you look at old illustrations, you will often see both these processes in action – a wide shallow wooden vat in which people are treading the grapes, and nearby a wooden press using either a wooden screw or a system of long levers to obtain the necessary force. Like all professional winemakers, we use sulphur dioxide in the making of our wine to protect it from harmful bacteria and from oxidation during aging in our cellar and subsequently in bottle. 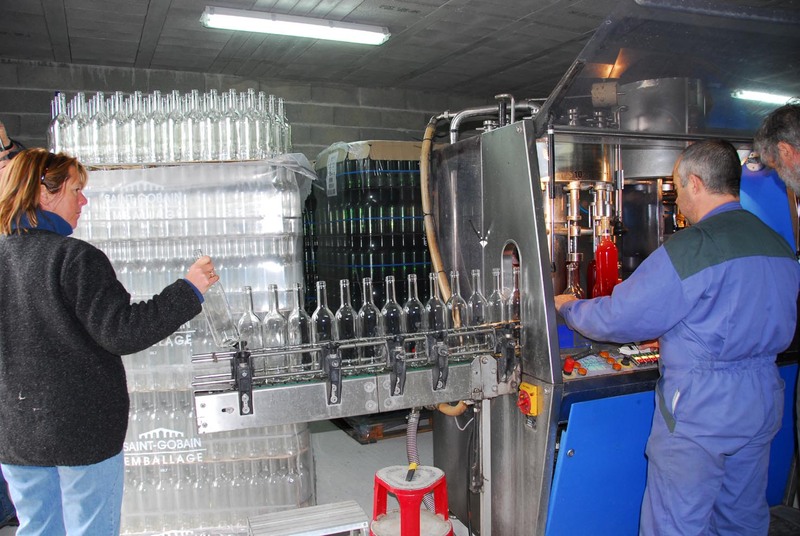 At bottling, we ensure that the wine contains the minimum quantity necessary to protect it. 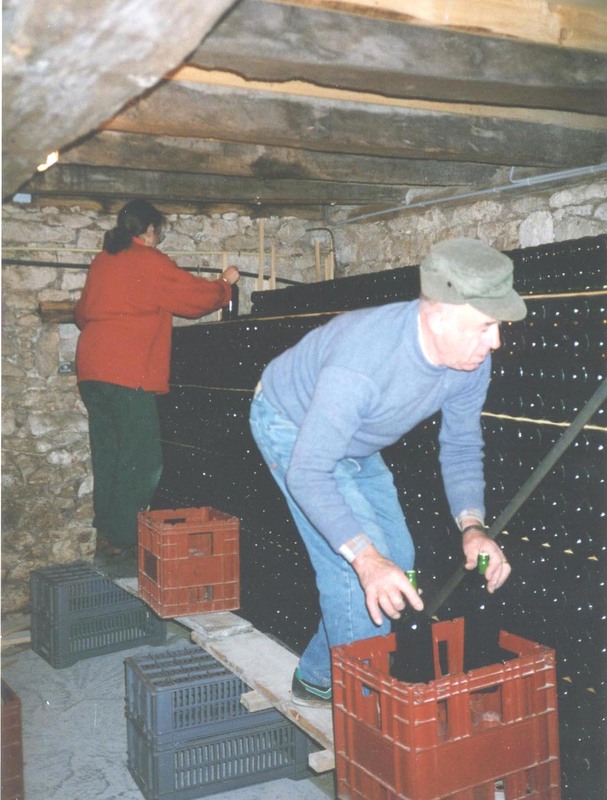 A few enthusiasts do produce wine with little or no sulphur dioxide, but it must be stored permanently at low temperatures, including during transport and is impractical for most purposes (see Natural Wine). Note that sulphur dioxide (SO2) is often incorrectly and confusingly referred to simply as 'sulphur'. For our hand harvest, the grapes are brought to the chai in plastic boxes holding 50 litres stacked on palettes. Especially for the white and rosé it’s important to minimise oxidation of the juice – this is why we use small boxes so that the grapes are not broken. For the machine harvest (red only), the grapes are tipped from the harvesting machine into a trailer, which is then taken off to the chai. Harvesting machines always break some of the grapes; however for the red, the issue of oxidation is less important, the grapes are inside the vats within 20 minutes of being harvested, and the red harvest is much later than the white, so the temperature of the grapes is usually much lower, slowing oxidation. In all cases the grapes are first passed through the destemmer (égrappoir) to remove the stalks - these contain a lot of tannin. In the case of machine harvest, the berries are shaken off the stalks, which are mostly left on the vines, but the destemmer ensures that the few that get through are eliminated. 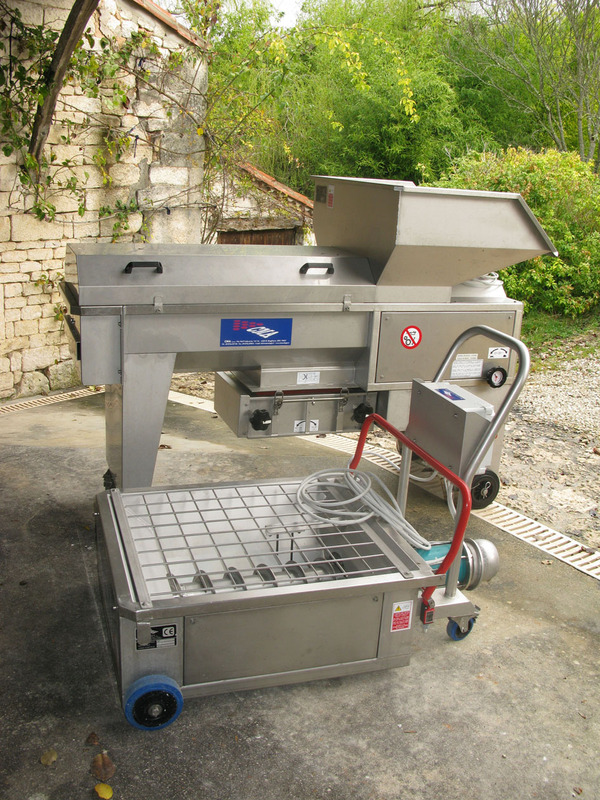 The destemmer incorporates a roller crusher (fouloir) that lightly crushes the grapes to break the skins before they are pumped to the next stage. For white wine, the crushed grapes go into the press. This is an automatic, programmable pneumatic press, which works by inflating a flexible membrane that presses on the grapes over a large area, and extracts the juice very gently without crushing the seeds. The juice runs from the press by gravity into a vat in the chai, where it is fully protected from air contact and oxidation. The process for rosé (press method) is similar, but the crushed juice remains in the press to extract colour for a period of around four to twelve hours. During this time the harvest is kept cool by putting dry ice in the press. The grapes are then pressed as for the whites. Judging the moment to press is difficult, as the contents of the press are not very uniform and samples can be deceptive. Since the speed of extraction varies very considerably from year to year, there’s no question of using a fixed time period. In addition, the action of pressing extracts a lot more colour, and thereafter, the colour changes considerably during the wine making. For the red wine, the crushed grapes go straight in to the vats. The juice for the rosé (saignée method) will be taken off from these vats after a few hours, when the colour is judged correct, with the same difficulties as above. One can usually rely on the required moment to occur around 4am! For the whites and rosé, the juice from the press is cooled to prevent premature start of the fermentation. It is then clarified to remove some of the suspended small particles of grape solids. This is done simply by leaving the juice to settle so that the solids fall to the bottom, and then decanting the clearer juice from the top. This process (débourbage) is necessary because too much solid matter will coarsen the flavour of the wine. It is quite quick for us to do, because our vats are small and therefore settle out quickly. The vats are inoculated with a yeast carefully chosen for the style of wine we wish to make, and for the conditions of fermentation, in particular the temperature to be used and the degree of alcohol expected. We use a different strain of yeast for each of our wines. It is possible to use the indigenous yeasts that grow on the surface of the grapes, and some producers believe this provides a better result, perhaps because the several yeast varieties usually present may increase the complexity of the wine. On the other hand, there is no knowing what strains will be there and whether their properties will be desirable or not. Tests have shown that the varieties present are different each year, even on the same vineyard, so they do not really form part of the individuality of the property, as is often claimed. Arguments are often made against prepared yeasts on the grounds that they are ‘artificial’ as opposed to the ‘natural’ yeasts occurring on the grapes; this reasoning does not make a lot of sense. The commercially prepared yeasts have been developed by collecting yeast varieties from winemaking operations, and then selecting and propagating clones with good properties – exactly as the vine varieties we all grow have been developed over centuries. The sole difference is that it is only in recent times that we have had the knowledge and the equipment to be able to collect, select and propagate clones of microorganisms such as yeast. Note that this has nothing to do with genetic engineering! At inoculation, great care is needed to bring the yeast preparation to the same temperature as the vat; failure to do so will cause high mortality to the yeast cells when they hit the cold juice. It is very important to inoculate with a large population of healthy yeast that can reproduce rapidly to occupy all the environment of the vat, thereby denying a foothold to undesirable yeasts and other microorganisms. The fermentation usually starts between 12 and 24 hours after inoculation. 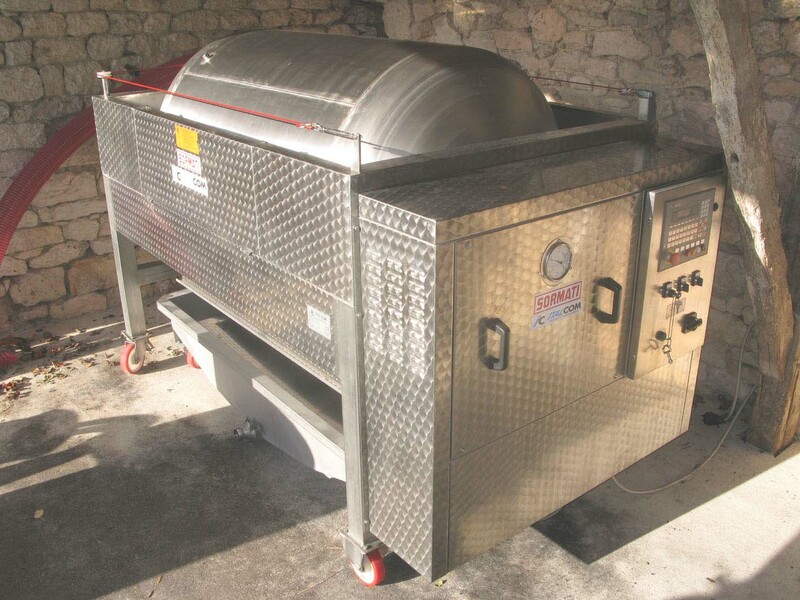 Our vats are fitted with heat exchangers which can be set thermostatically to hold the temperature at a precise level. Our whites and rosé are usually started at 15°, with the temperature allowed to drift upwards towards 18° or so at the end, to help the yeast finish the fermentation. During the fermentation the yeasts convert the sugars in the juice (mostly glucose and fructose) to alcohol and carbon dioxide – large amounts of CO2 are emitted during the process. Small quantities of many other substances are also produced, many of which contribute to the eventual flavour and aroma of the wine. Note that the CO2 does not make any net contribution to global warming – it is a part of the CO2 absorbed by the vines from the atmosphere during the year’s growth. For the red wines, it’s necessary to have contact between the floating cap of skins and the juice, in order to extract fruit and colour. There are many ways of doing this – our choice is manual punching down of the cap to break it up and mix with the juice (pigeage), combined with pumping juice up from the bottom of the vat and over the cap. Correct management of the extraction is vitally important – too little and the wine will be thin, lacking colour and fruit, too much and at the wrong time and too much tannin will be extracted, making the wine hard and astringent. The fermentation is monitored twice each day by measuring the density of a sample – this indicates the quantity of sugar remaining and a graph shows clearly the progress. The fermentation slows progressively and it’s important to watch the graph for any signs of non-uniformity, which might mean the yeasts are having problems. Action may then be needed to avoid the fermentation stopping before all the sugar is finished – assuming a dry wine is being made, which is usually our case. Action may be to increase the temperature slightly, or to provide a controlled dose of oxygen, which yeasts need to live. When all the sugar has been consumed, the fermentation stops and the yeast cells die. For the white and rosé, there is now little more to be done until after the winter. We normally keep our red wine on the skins for some time after the end of the fermentation, tasting constantly to determine when to separate off the juice. We are looking for an increase in the weight and body of the wine, but watching to ensure that we stop before too much tannin has been extracted. The vat is then drained and the solids (marc) removed and pressed. 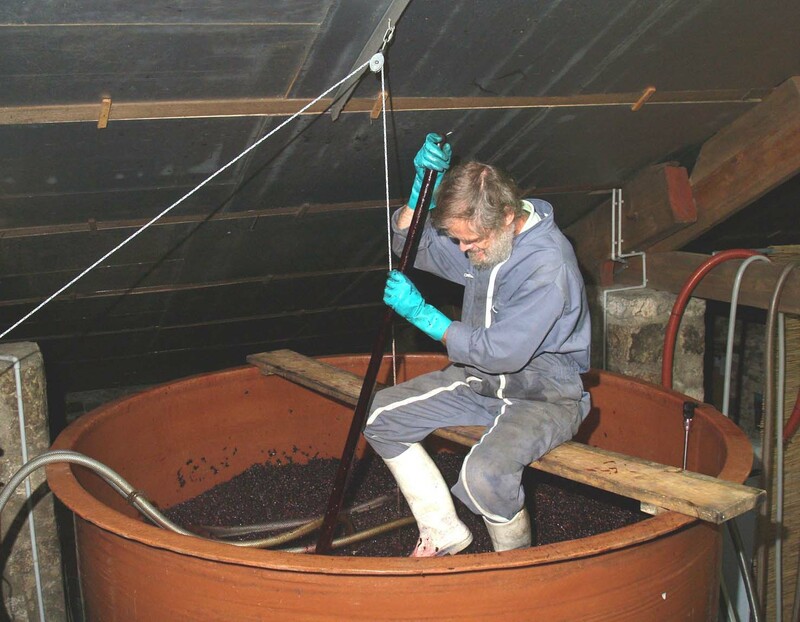 The free-run wine (vin de goutte) and the press wine are kept separate for the time being, but they will usually be blended back together eventually. The press wine has the potential to bring both benefits and drawbacks to the blend; it is more tannic and harsh than the vin de goutte, but also has more richness and body. Finally, for the red principally, there remains the malo-lactic fermentation (malo). This is a second fermentation in which the malic acid of the wine is transformed into lactic acid by bacteria. The lactic acid is less aggressive to the taste than malic acid (the tart acid of apples) and the process therefore softens the taste of the wine, as well as adding further side products to contribute to the flavour. In the past, the malo would occur naturally when the wine began to warm in the spring; this has the disadvantage of being somewhat hit-and-miss and also means that the wine must be left unprotected by sulphur dioxide through the winter, since sulphur dioxide inhibits the malo bacteria. Nowadays therefore, the wine is normally kept warm (18-20°) after the alcoholic fermentation has finished to enable the bacteria to develop. Freeze-dried bacteria can be added to ensure a rapid start to the process; otherwise there’s a delay while the natural population builds up – sometimes this can be rather fickle and occasionally doesn’t happen until after the winter. The malo is sometimes carried out on whites and rosés, depending on the style of wine. With us, it is not usually appropriate. The next stage of the winemaking is best described by the French word élevage, meaning ’bringing up’ as of children – ‘aging‘ doesn’t have quite the same ring to it. The whites and rosé will remain on their lies (mostly dead yeast cells) until the spring. Over this time the yeast cells slowly break down and improve the ‘fatness’ of the wine. We also hope for a good cold spell over winter that will cause some of the tartrate in the wines to deposit out on the walls of the vat. This reduces or eliminates the tendency to drop crystals in the bottle. Failing this, we will have to cool the wine by refrigeration for a time after the winter. In the spring, these wines will be tested for protein stability – if the wine contains too much natural protein, there is a risk of a fine deposit occurring in the bottle, especially if the wine gets a little too warm in storage or transit. If the wine is unstable, a proportion of the protein is removed by fining with bentonite, a form of natural clay. This is mixed into the wine, allowed to settle out and the clear wine decanted off the sediment. This process also helps to clarify the wine prior to bottling. At the same time, the excess carbon dioxide dissolved in the wine during fermentation is removed by passing nitrogen gas through the wine. Finally the wines will ready for bottling in the late spring. At Domaine du Garinet, the red wine is normally divided - some is put into barrels, and some will remain in the vats. Contrary to white and rosé, red wine needs oxygen to soften and mature. This can be provided by rackings done in such a way as to allow air contact, by periodic injections of pure oxygen, or by continuous small doses of oxygen, provided naturally by the porosity of barrels, or by special automated injectors (micro-oxygenation). Rackings have the advantage that the wine can be separated from the lies, and the dissolved carbon dioxide from the fermentation removed at the same time. The other methods provide a much smoother dosage of oxygen, at a similar rate to its consumption by the wine. We use rackings, periodic injections and barrels as appropriate. Continuous injection equipment is not very suitable for use in our relatively small vats. Of course the barrels, especially if they are fairly new, also add interesting flavours to the wine, improving its ‘fatness’ and complexity. 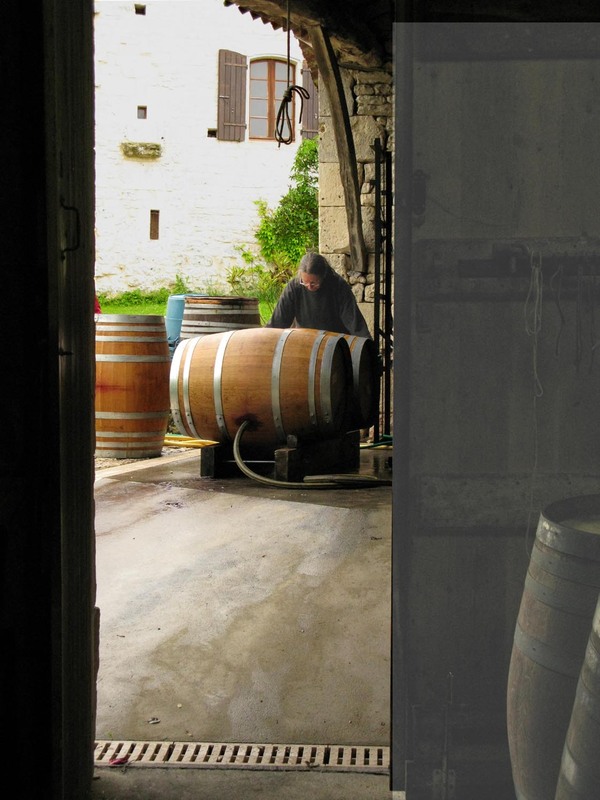 After the period of élevage (usually 1-2 years), the barrel wine will be pumped back into a vat. The wines will then usually be fined to adjust the balance and to remove a little of the tannin. Careful trials are done each year to determine the best fining agent, and the optimum dosage. Usually we use powdered egg albumin (essentially dried egg white) or gelatine. These materials are mixed with a little water, added to the wine and left to settle out. The wine is later decanted off, leaving the fining agent and the matter it has absorbed from the wine in the bottom of the vat. The wine is then ready for bottling. Our wines are bottled and corked, and then stored for aging in our underground bottle cellar. Bottles are labelled and capsuled when required for sale – because we keep the red wines for some time before sale, they are stored unlabelled to avoid deterioration of the labels. The wine is filtered as part of the bottling process – this is the only filtering it needs. The conglomerate corks we use for white, rosé and early drinking red are made largely from cork granules, with a small proportion of silicone beads. They are extremely reliable, and the risk of cork spoilage of the wine is completely eliminated by a sophisticated process of washing the cork granules with liquid carbon dioxide. We continue with natural corks for the reds because they are more porous and we consider that the small amount of air that seeps through may play a part in the aging process. This is not proven, and several long-term experiments are under way, but for the time being we stick with what has worked in the past. More porous varieties of conglomerate and plastic corks are also becoming available. We do not like plastic or screwcaps much, but more porous conglomerates might be the future – they support the cork industry, which has important environmental benefits in Spain and Portugal, and they avoid the problems of leakage and the unavoidable occasional contamination associated with natural corks. They are also considerably cheaper than natural corks, which can easily cost more than the bottle. We do not approve of the current fashion for very heavy bottles for high quality wine. These are very wasteful of energy in their manufacture, transport and disposal. They’re also harder work for us to move around and take up more space! The bottles are stacked into wire pallet crates holding about 600 bottles – these can be moved and stacked easily by a fork lift and are much more convenient than the old method which we used to use of building stacks of bottles. The bottles are labelled and capsuled by machine when required for sale. For the reds, this may be after several years of aging in the bottle cellar.